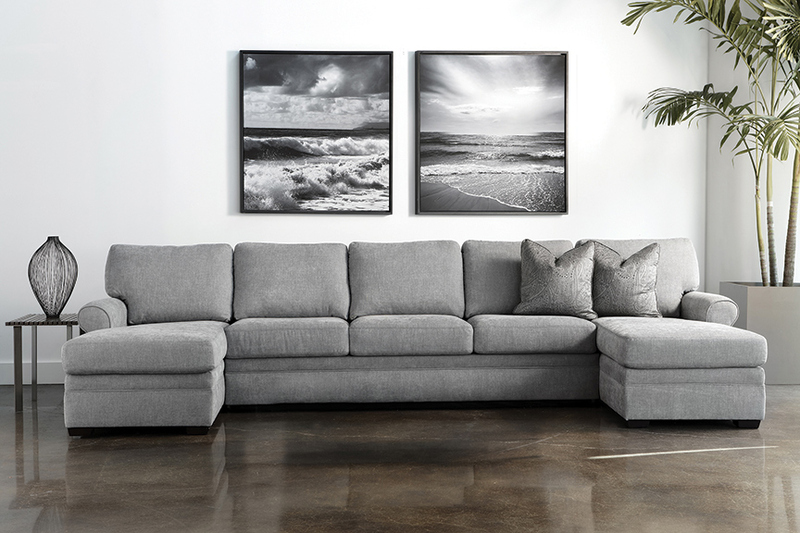 Today's sleeper sofas give guests a good night's rest. For many now-grown children — aunts, uncles and grandparents themselves — the last stunt they want to pull during the giving season is banishing someone to a lumpy, musty, basement-dwelling fold-out couch. The memories of struggling with a squeaky, unbearably heavy mechanism only to uncover a sack of springs, foam and batting are still too fresh in their minds to even consider a sleeper over a one-and-done air mattress. He’s not lyin’. The American Leather creation is a far cry from the equatorially split steel-bar and straw-filled abominations of yesteryear — so much so that the mattresses in this line of sleeper sofas aren’t just on par with a standard mattress. They’re better. Of course, the length of the mattress only addresses one problematic facet of the sleeper sofa conundrum. What about bearing the burden of mythical character Sisyphus, condemned to feeling like your pushing a rock up a hill every time the thing has to be opened or set up? What about goose-down feathers poking through the cover like thousands of invisible needles? “Most sleepers have a conventional mattress that folds in thirds, and after, always holds the creases for poor comfort. With the Comfort Sleeper you will never experience [this]; each fold is hinged,” Anzalone demonstrates. The patented design slides out without incident, and each third of the mattress is attached to a solid-wood, fabric-covered platform. Gone are the exposed springs and single-ply mystery fabric. Gone are the questionable masses jutting at lower backs during midnight readjustment. This holiday season, treat visiting family and guests to nights spent cradled by Tempur-Pedic or gel-infused memory foam while treating your home to a fashionable, adaptable addition. Available in all shades of leather and fabric options — even offering stain-resistant Crypton® fabrics — the premium options afforded by these next-generation sleepers will fill the voids left by sleepless nights on grandma and grandpa’s junker. Anzalone admits, “they are an investment.” But in considering the luxury of avoiding late night, last minute runs to the store for air mattress replacements, or the inevitable chiropractic appointments you’ll be expected to pay after suggesting your niece just “sleep on the floor,” the upfront cost doesn’t seem nearly as bad. “The American Leather collection is the best on the market, bar none,” says Anzalone, and with a lifetime of home furnishing experience, his is an opinion that homeowners can trust. Unfortunately, the only downside to this sleeper sofa is going to be getting visitors to go back home.